The effort to find “replacement players” is backfiring. The historic power of sports unions is rooted in three truths: they have a long record of improving wages and working conditions for their members; they are one of the few places in US society where the issues of labor and collective bargaining are discussed under a powerful spotlight; and most critically, when sports unions win, their sport invariably wins. Time and again, we have seen victories by players associations lead to the financial and competitive growth of the sport itself. There is a damn near comical history of team owners and commissioners in every league howling that the end is nigh when free agency or better practice schedules are won, only followed by more interest, higher ratings, and a better product on the field. 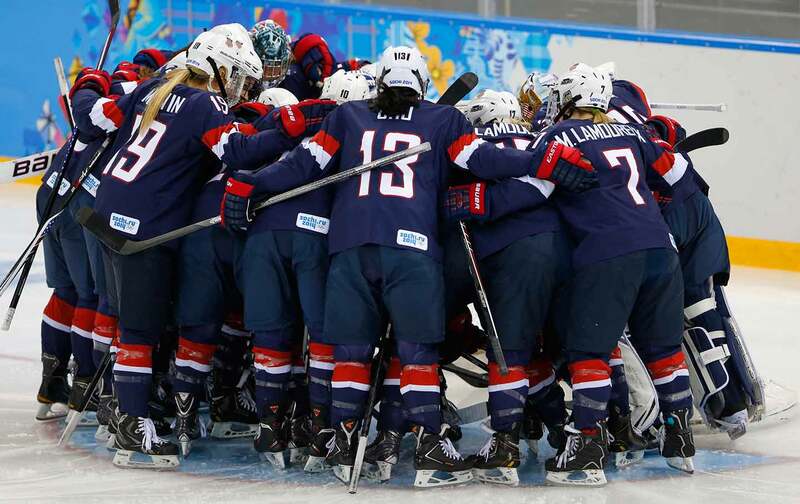 That is why the strike of the US women’s ice hockey team before the upcoming World Championships in Michigan matters so much for the future of their sport. I wrote here about what the issues are, but it comes down to decent wages, benefits, investment in youth programs, and an end to the petty disrespects like flying the men’s team in business class while the women ride coach. These seem like reasonable demands, but US Hockey and their $440,000-a-year executive director Dave Ogrean have opted to hire scabs and field a “replacement team” for the World Championships. That effort is failing spectacularly. At all levels, women hockey players are seeing that scabbing at this critical juncture, would jeopardize the very future of their sport. USA Hockey has been rejected by so many prospective replacements that, as has been widely reported, they have asked women in high school, in the 16 and under leagues, Division III hockey program, and have even approached – literally – “beer league” hockey players about taking the ice in place of the defending world champions. As a player who refused to scab told ESPN, “I mean, I just play in a beer league. I just play for fun now. I don’t train like I did in college. It’s insane.” It is the equivalent of finding someone who plays flag football and sticking them into an NFL game to block Von Miller. It is also similarly dangerous. The idea that someone can just walk in without training an play in a World Championship is a recipe for injuries, lawsuits, and makes a mockery of the sport. Yet the chance to actually play in a World Championship can also be seen as a once-in-a-lifetime opportunity, which is why it is all the more impressive to see these teenagers, second-tier players and weekend warriors line up to reject their most fantastical daydreams out of the political understanding that they would be undermining the sport that they love. NHL players fully support the U.S. Women’s National Team’s efforts to reach an equitable agreement with USA hockey. It is important that the best American women players be on the ice for the World Championship and the notion of seeking replacement players will only serve to make relations, now and in the future, much worse. We trust this dispute will be resolved fairly and quickly. These women understand inequality when they see it and are expressing their right to be treated fairly as athletes and workers. Of course, they have our support in daring to withhold their services until a fair agreement is reached. [We] stands in solidarity with the efforts by the U.S. Women’s Hockey Team to secure fair and just treatment for its players. The #MLBPA continues to encourage ALL women hockey players to stand united in support of #USWNHT efforts to secure improved conditions. When this dispute eventually gets settled, all may be forgiven but USA Hockey should know that it sure as hell won’t be forgotten. The old saying from the labor movement rings true: scabs leave scars.